14 great colors, 1 color per sheet. 8-1/2" x 11" sheets with 35 peel-off strips that are 5/16" wide. 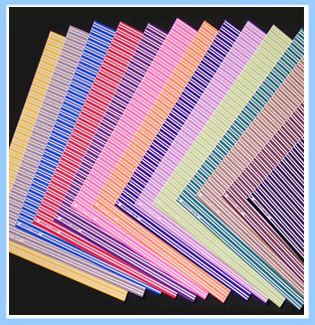 This glossy, brightly color-striped tape is sold as letter-size sheets of die-cut strips 5/16" wide. Identi-Tape is a high-temperature proof (300 Fº) adhesive vinyl tape for marking & identifying instruments, tools, climbing gear, kitchen utensils, etc. It is also used in day care centers for identifying bottles and kiddie utensils. Identi-Tape Gear-Tape resists high-temperature commercial washing and sterilization without peeling, fading, wrinkling, or becoming gummy. Gear-Tape is latex free and CPSIA Compliant (child safe). Note: When wrapping strips around items such as caribiners, first make sure they are cleaned with soapy water and rinsed to be free of dust and suntan lotion. Let dry, then apply a strip firmly and overlap the ends by 1/4" on one of the flatter sides of the spine. Let adhesive cure 24 hours. Gear-Tape comes as letter-size 8-1/2" x 11" sheets with 35 page wide peel-off strips 5/16" wide. To make shorter segments, just cut into the sheet with scissors at the width of strips you need. Our Identi-Tape Sheets™ will color-code baby bottles and will make your child's stand out against all the others. Use them at daycare or in your home. They are dishwasher safe and waterproof. © 2005-2019 Applied Labels LLC. All rights reserved. Designed by Teknarus.